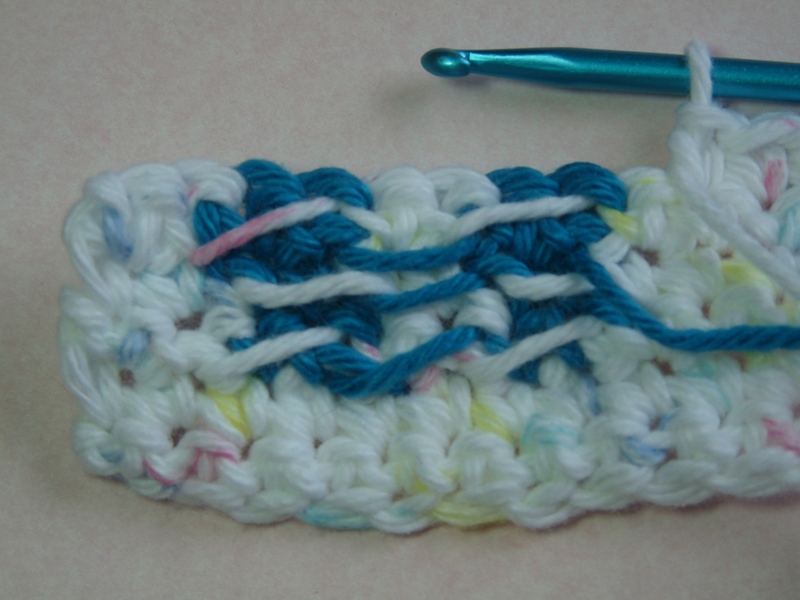 A lot of my patterns have a design crocheted into them, which require color changing. I've had several people ask me questions on how to do this, so I thought I'd write up a tutorial, and include some helpful tips that work well for me. 1. 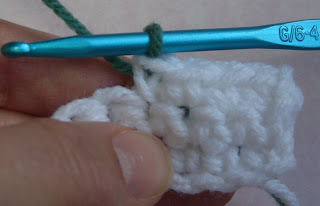 When it's time to change colors, work the last single crochet stitch of the old color as you normally would by inserting hook and drawing up a loop. You now have 2 loops on the hook. Do not yet work the last yarn over to complete the stitch. 2. Hold the new color alongside the hook and yarn over, picking up the new color. Draw the new color thru the last two loops of the old color. 3. The last stitch is complete in the old color, and the new color is on the hook to begin stitching. Tip #1. These color change instructions show how to change colors when working a single crochet, but the same instructions apply no matter which stitch you're working. 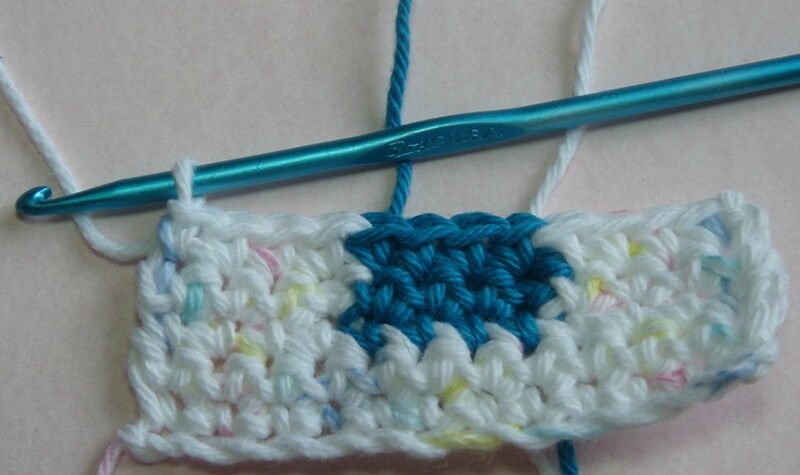 You'll just use the new color to complete the final yarn over of the last stitch of the old color. Tip #2. I've often been asked if I break off the yarn between each color change, and the answer is no. At least not if I can avoid it. a)If I have a lot of color changes, I first consider if the wrong side of the piece will be seen. If the wrong side is going to be covered up, like a potholder or a pillow, then I will usually let the color changes "strand" across the back. By that I mean, when changing color, I drop the old color and just let it hang in the back, then pick it up later when I need it, letting the yarn strand across between the last stitched area and the new stitched area, as shown in the photo below. This is a bit sloppy looking however, and I only use if it will be covered later. 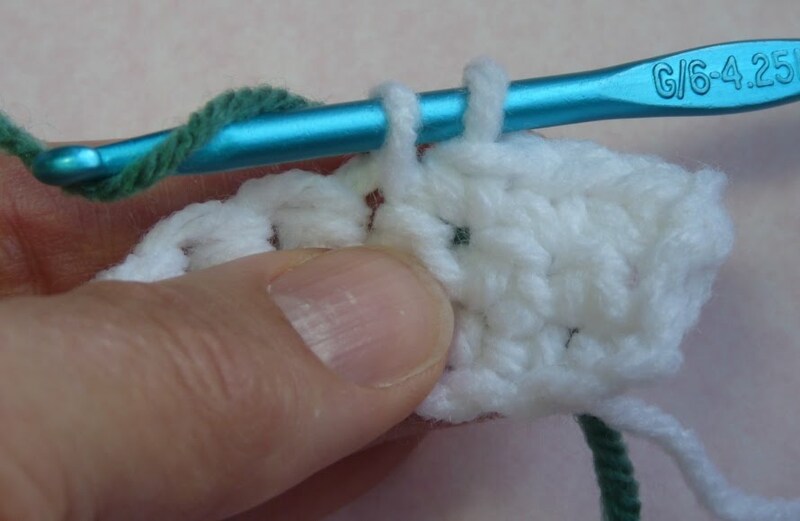 Also, if you do use this method, make sure to let the yarn strands drape loosely, pulling too tight will make the piece pucker and not lay flat. b)If I'm working on a design like the one in the picture below that has a background color with a design of a different color(s) in the center, I'll work out of both ends of the ball of the background color. One end to work the right side of the design and the other end to work the left side of the design. c)If the backside of the piece will be seen, then I want it to be as neat as the front side. 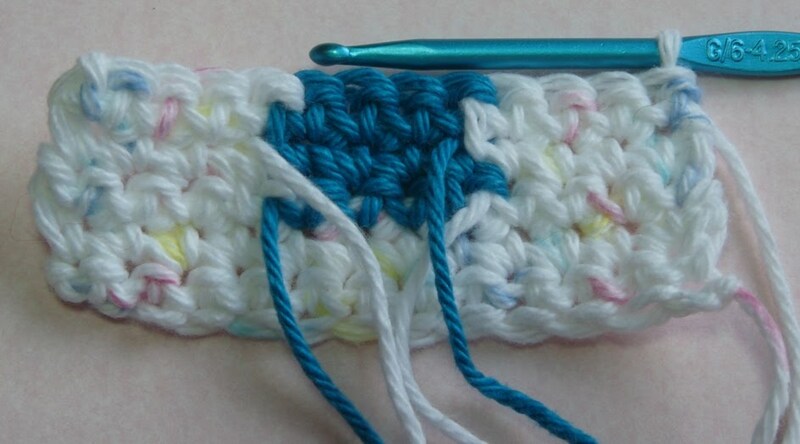 This can be accomplished by using a separate ball/strand of yarn for each color, so that none will be stranded across the other. You can use yarn bobbins to wrap the yarn around and then unwrap it as you need it. This helps keeps the yarn from getting tangled as well. Tip #3- It's very important to always keep the working yarn of all colors to the wrong side of your work. This means that when you're working the right side of your piece, then all the working yarn is to the back (as in first photo below), but when you're working the wrong side of the piece, then all the working yarn will be to the side facing you (as in second photo below). Tip #4 - After changing colors, always give the strand of the old color a small, gentle tug. Sometimes a small bit will stick out between the two stitches, and giving it a gentle tug smoothes it back out. 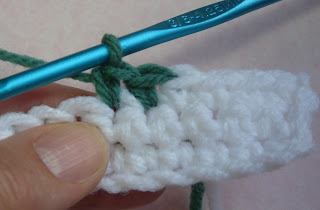 I have a question about Tip # 3.. is there a secret to crocheting with the thread on the front? I can't seem to work this out without having bumps.. Thanks for sharing, I love your tips and patterns! The working yarn should always stay to the side of the work that is considered the back side or wrong side of the project. 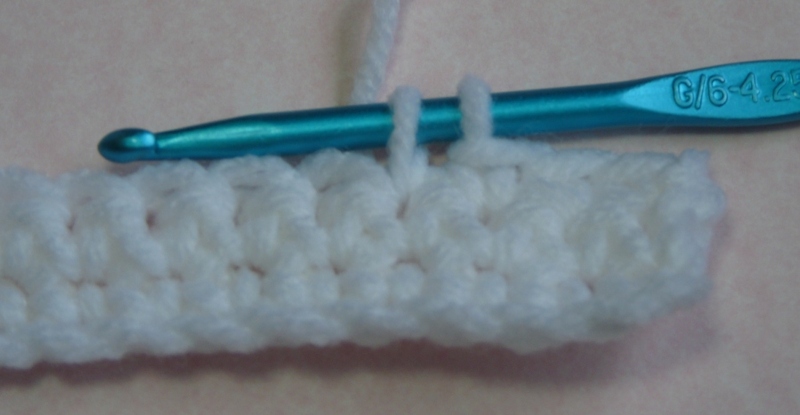 So when you're working a front side/right side row, the working yarn will hanging to the back of the project. And when you're working a back side/wrong side row, that row is facing you, so the working yarn should be hanging on the side facing you as well. Thanks for this! 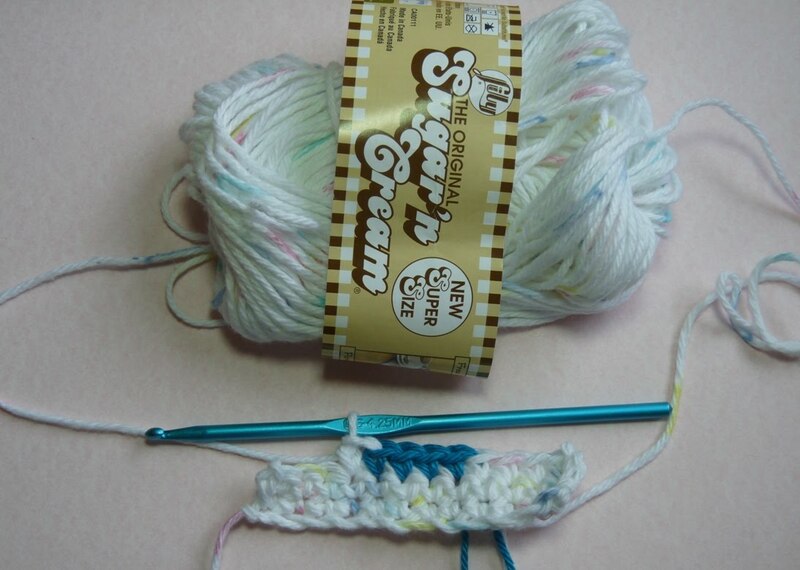 I love to crochet and am actually quite good at it, but changing colors has always been a mystery to me. Until now! I've bookmarked the lesson for future reference and am now off to look at all the other goodies you have here! Michele: excellent idea, and I like it much better than having the yarn carried across the back. I will try this next time. Even if a pot holder is considered a "one sided" item, if someone picks it up the back will look ugly if there are carried strings of yarn. You have great projects, thanks so much for sharing. Have a look at my blog I’ll be so glad. Imitation is the Sincerest Form of Flattery..
Yarn Snatching Crime Caught on Tape!